How have you found working on your creative projects while working a day job so far? Now, a lot of what I talked about has been centred around mindset. It’s what I believe separates the winners from the losers. Without the right mindset, you’re destined for mediocrity. By now, you’re familiar that working on your side projects, building your creative business and practicing your skills requires discipline, planning and control over your own thoughts. You’re going to need to react to situations at the day job against what is natural, which I’ve explain is essential to having the right type of mental energy to go home after work, just to continue work. 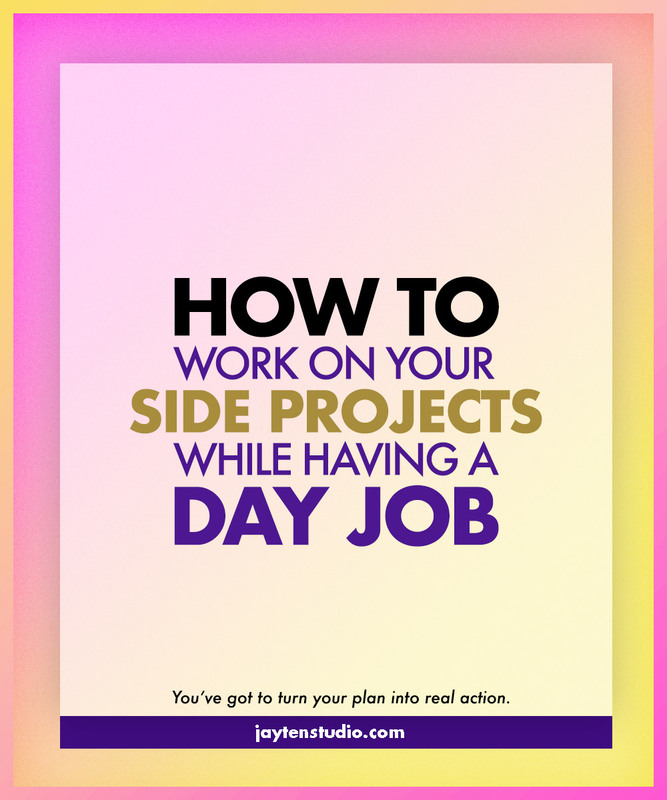 Once you’ve understood why the day job is important it’s now time to put what we have learned into actionable steps so you can make more time to work on your creative business, side projects and passions. How do you start building a business while working a full time day job? Where do you start? How do I make the time? Most of those questions I’ve answered but, here we’re going to round everything up into something you can start tomorrow—or even today! Without a plan, it’s hard to know where to go. It’s even more essential that you plan your projects and goals because the majority of the day has already been taking up by the day job. You can’t waste your energy after the day job fumbling, figuring out what needs to be done. That part should have been decided hours or days ago! Pick a day that’s best for you to plan for your week and get writing. I use a simple planner with everything hand-written so that when I open this up, my task list is right there. One caveat, you’ve got to turn your plan into real action. While it may feel good to know you’ve accomplished the first step by writing your tasks and goals ahead of time, you’ve barely stretched a muscle. You’ve probably found out by the time you sit down to work on something, it’s 9pm and it’s already bed time. First up, be willing to make some tradeoffs so that you can meet your goals. If that means cutting out Youtube videos, scrolling on Facebook or going out for drinks on a Tuesday—cut it out! Secondly, the feeling of an overwhelming task list can halt us from ever starting because you planned such a huge mission. You end up procrastinating to avoid the difficult but important thing to you. What disappoints us creatives is not achieving what we had set out to achieve. Trying to cram all the things into your already limited time during the week is a sure way to burn out—fast. So instead, break it down. Knock out smaller, bitesized tasks during the week. Ultimately, these seemingly tiny tasks accumulate to accomplishing the bigger goal. Do the minimum. One hour each day set aside to work on your creativity. These next two tips will probably sound like I’m contradicting myself, but I assure you this will lead to more time and more energy to work on your creative business. It’s not all about work, work, work. It’s more, work, work, rest. By Friday, you’re already looking forward to the weekend for a much needed break. As I wrote about in If Success Is Not Your Goal, Do This, going out on a Saturday evening is not much of a break, is it? Your time is better spent recouping and preparing for a successful tomorrow. On that note, my friend Darian (@darianrosebrook) has an incredible, but satisfyingly simple way to prepare for a successful day. With all his other responsibilities and commitments, he still has time to rest just enough to keep providing value to his community. Amazing. So if you choose to rest on the weekend, awesome. Choosing to have specific evenings during the week as “no work” and only for resting is sure benefit also. Scheduling rest while working a day job will leave you with more energy for your creative projects. How much rest do you need? I can’t give you a one-size fits all answer. You’ll understand your limits. Perform a trial, see what happens when you work intensely for three days, then rest for two. Or even go all out during the weekday and use your weekend for rest and or light work. I’m already a massive fan of planning. But as I’ve discovered, working on your side projects for 10 months straight without a proper break does damage. It’s not going to be easy. As a result, I found this one method helps escape from the laborious day job. Meaning you can rest productively. You remove your strict schedule opening up room for more creative things. The change of routine can lead to unexpected ideas. There’s no rush or urgency, this is a day to take it easy. The purpose of this day is to not have strict schedule to work with. Rather, you go with the flow and break out of the stress zone of your day job and side projects. You’re giving yourself the permission to do other things and for creatives, this mode of expressing our creativity can be the boost needed to complete the bigger, more important projects. As a bonus tip, but to disclaim one that I haven’t emphasised during this series because there’s potential that this “ask” can turn sour—it’s to decrease your hours at the day job. For some, a part-time role is out of the question because of the responsibilities and bills and whatnot. Yet, if given the opportunity the amount of time you’ll end up having for building a business you love will be incredible. I’ve known of creatives including myself, who have managed to negotiate with their employer a part-time position and as a result, are thriving and feeling more creatively free. Again, this may or may not work out well so you have to decide what can you sacrifice to have more time for your side projects. Balancing has been a key theme for this series. Once you’re able to get this right—which will require a lot of trial and error—you’re no doubt going to see net results. Get unstuck by focusing on the next step. Approach your day job with a positive work ethic. Schedule time to create, schedule time to rest, freestyle sometimes and take care of the important things first to survive—your day job. Ah man! So that’s it for this six-part series on balancing your side projects while working a day job. A big thank you if you’re a reader of my articles, I appreciate it loads! This series summed up what I’ve learned working two years with a day job while building a creative business. I hope if you’re currently struggling, in a similar position and feel you’re stuck at the day job that these articles became the spark needed to get going. If so, let me know how you’re getting on by tweeting me! I’m always there. Want to go back and read them all?